The best advice I can give to all incoming freshman and transfer students is to join some type of club on campus. Joining a club on campus is the easiest way to meet new people and it is extremely important in being able to get the full college experience. College is what you make of it, and what you put into it is what you will get out. Fraternities and sororities are a great way to meet people and learn more about yourself. Fraternities and sororities typically have rituals and creeds which promote ideals such as friendship, loyalty, academic achievement and intellectual development, service to the community and your school, honor and integrity, leadership and personal responsibility. Many students avoid Greek life, assuming that it is all about cliques and partying. Despite these negative preconceptions seen on TV and in movies, Greek life does offer many social, academic and professional benefits to its members. Greek Life is so much more than going to parties and hanging out with the boys in fraternities or the girls in sororities. 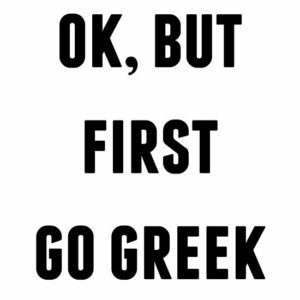 Students who join Greek organizations are able to build a network, make friends and develop leadership and social skills, and will likely graduate with many useful qualities that could take them far within their future careers. Joining a fraternity or sorority exposes students to a large network of collegiate members and alumni that can help undergraduates transition successfully into college life, and help them find opportunities that will enhance their development. Fraternities and sororities provide a home away from home in many cases, and encourage lasting friendships with your brothers or sisters. Personally, I know if I ever needed anything I will always have a sister willing to help me out. You get the opportunity to fail miserably and have brothers and sisters that love you, and care for you, pick you up and dust you off and help you to do it again. You will always have endless support from your brothers or sisters. It isn’t an exaggeration when people say the friends you meet here in Farmingdale Greek life will be friends that you will have for the rest of your life, along with all the memories you have made along the way. Joining a Greek organization really is like joining a family. The academic portion of your college career is extremely significant in determining your future success. A main purpose of the Greek Life community is to encourage and develop academic achievement among its members. Several factors contribute to this academic atmosphere, including peer tutoring, and chapter study-hours, which help members learn better study skills. Within each fraternity/sorority there are members involved in a wide variety of colleges and departments, which helps you to be able to seek help from others who may be taking or have already taken the same classes you are, and there will be upperclassmen who can advise you on which classes and instructors are the best within each academic area. Nationally just a little over 50% of college students graduate. However, U.S. Department of Education data shows that members of fraternities and sororities graduate at a rate of 70%. Fraternities and sororities also help improve social skills tremendously. According to Fraternity Advisor, 85% of the executives of Fortune 500 companies and 80% of United States presidents since 1900 have been members of Greek Life. Greek Life membership helps men and women learn leadership skills, gain a sense of social identity, and learn to work with personalities differing from their own. Every Greek Life organization has at least one philanthropy that they work with, and work to raise money for. The Greek Life organizations at Farmingdale State College are not the “typical Greek Life” organization that TV and movies portray us to be. Greek Life is involved in raising thousands of dollars each year, creating events for the community, as well as supporting the community and having events for our members to create a stronger bond. Greek Life has so many opportunities available for you to get involved with your community or on campus. You’ll hold your own events as an organization, as well as attend other organizations’ events. You’ll do community-service hours that will not only make you an active member of your community, but will also build your character. Every spring semester Farmingdale Greek Life hosts a competition among all of the organizations called Greek Week. One of the events during Greek Week is called Can Castle. Organizations bring in cans and many other non-perishable food items, that at the end are donated to families in need across Long Island. This past Greek Week, Farmingdale State College Greek Life collectively donated over 100,00 items to those people who really need it. When going from high school to college it is important to try new things and learn more about yourself. Joining a fraternity or sorority can be a great way to do both these things while meeting so many people at the same time. What you put in is what you will get out of your college experience, so it is important to make the most of it in any way you can.